TGIF. It's been a long week... so let's drink up to the weekend! I'm not much of a drinker, even moreso since I got pregnant years ago, but I certainly appreciate cocktails every now and then. I find cocktails to be a great source of inspiration when it comes to dessert recipes. So in honor of the weekend, I'm sharing this dessert inspired by margaritas. 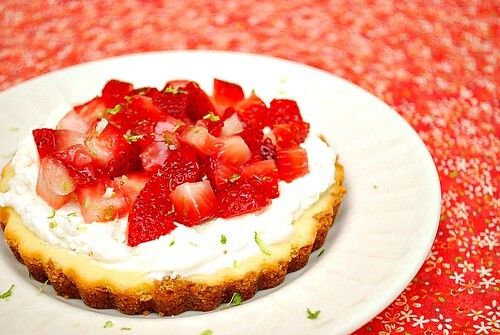 These Strawberry Margarita Cheesecake Tarts capture the fun margarita spirits of Grand Marnier and tequila with a healthy dose of key lime juice in a cheesecake with a garnish of whipped cream, fresh strawberries and a sprinkle of fresh lime zest. Bottoms up... with your forks up! This is absolutely my favorite key lime cheesecake recipe and I love how versatile it is to adapt in different ways. I received some fresh Florida Key Limes from my food blogger friend, Cheryl of Pook's Pantry when I went to Orlando weeks ago. I was thrilled to play with these and the first thing came to mind was key lime cheesecake. But how could I change it up into something different? At the grocery store, strawberries were on sale and after thinking about combining the key limes and strawberries, this is what I came up with. I also received some amazing shortbread from the wonderful folks of Duchy Originals from Waitrose. They seriously are so good and it was hard not to eat them as is. To incorporate them into this dessert, I processed the cookies to form the buttery shortbread crust and they came out fantastic. I highly suggest you try finding these cookies in your area... you'll be glad you did! 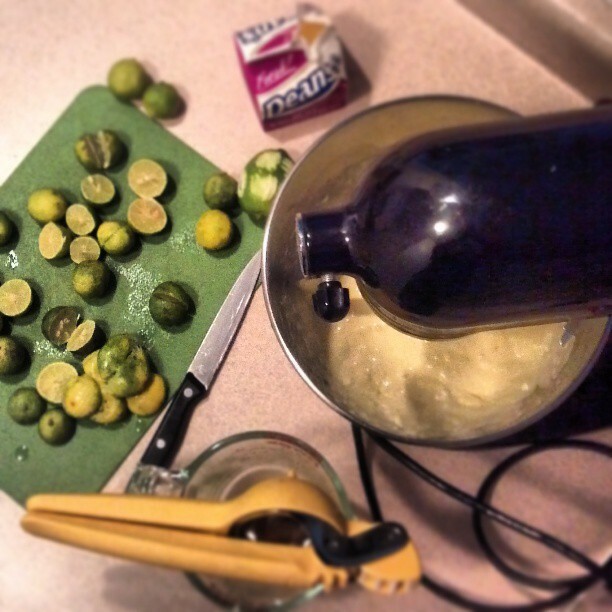 Mix together the finely crushed cookies, melted butter, 2 tablespoons sugar, half the lime zest and vanilla. Press mixture into 6 mini tart pans. Set crust aside. Combine sugar and lime zest and mix with the cream cheese in the bowl of a stand-mixer (or in a large bowl if using a hand-mixer) and cream together until smooth. Add eggs, one at a time, fully incorporating each before adding the next. Make sure to scrape down the bowl in between each egg. Add heavy cream, liquors and key lime juice and blend until smooth and creamy. Pour batter into prepared crusts and tap the pans on the counter a few times to bring all air bubbles to the surface. Place pans onto a baking sheet. Bake 25-35 minutes, until it is almost done - this can be hard to judge, but you're looking for the cake to hold together, but still have a lot of jiggle to it in the center. You don't want it to be completely firm at this stage. Close the oven door, turn the heat off, and let rest in the cooling oven for one hour. This lets the cake finish cooking and cool down gently enough so that it won't crack on the top. After one hour, remove cheesecake from oven and let it finish cooling on the counter, and then cover and put in the fridge to chill. Once fully chilled, it is ready to serve. To garnish, top with freshly sliced strawberries, whipped cream and a touch of freshly grated lime zest. Oh, YUM! This sounds and looks so delicious. I'm definitely making it this summer! I'm not much for alcohol in baking. But it truly does look delicious. I'd probably just leave it out. But the rest looks amazing. Love the combination of these flavors!!! I love a good shortbread crust - yum! This looks so incredibly good! I need to make this soon. Okay, I think I've just found the desert I'm taking to our family get-together next week! This looks amazing! I would love it if you would link up and share some of your wonderful recipes with my readers on my Foodie Friday Blog Hop ! You can share some of your favorite recipes (like this one!!) and find some new ones, as well! I just started Foodie Friday a couple weeks ago, but I’ve heard from several of my readers that they are loving it. Hopefully with the support of other bloggers, like you, I can keep it going. I'm drinking a glass of wine right now. The next sip is in honor of you! Wow, this looks really yummy!